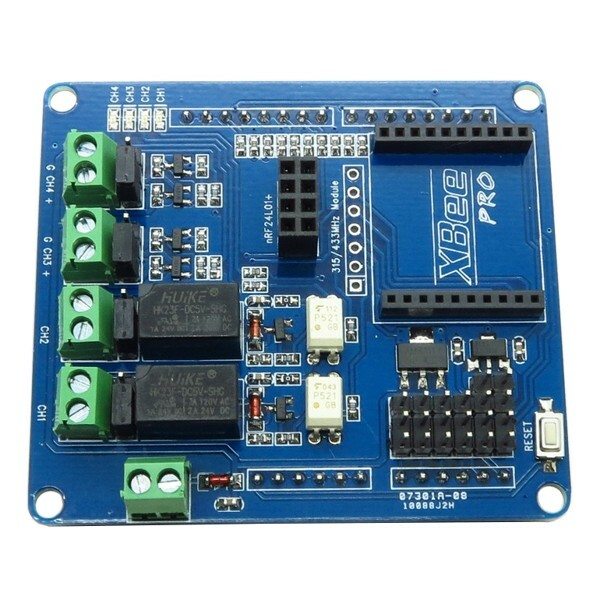 The Interface Shield for Arduino provides Relays, MOS Power Switches, an XBee socket and 3 pin analog SVG connectors. This Interface Shield has two mechanical relays for safely controlling external circuits and two solid state MOS power switches. The relays are rated for up to 120 VAC or 24 VDC at 1A and can function as NO Normally Open or NC Normally Closed by configuring associated jumpers. Each MOS power switch can handle up to 1A with a jumper selectable output voltage of 5V or an external power source. Each relay and MOS power switch channel has corresponding screw terminals and an LED status indicator. 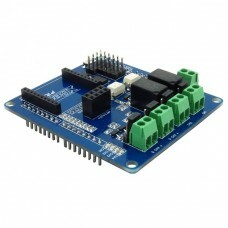 A screw terminal is also provided for an external Arduino compatible power source of 7-12V. 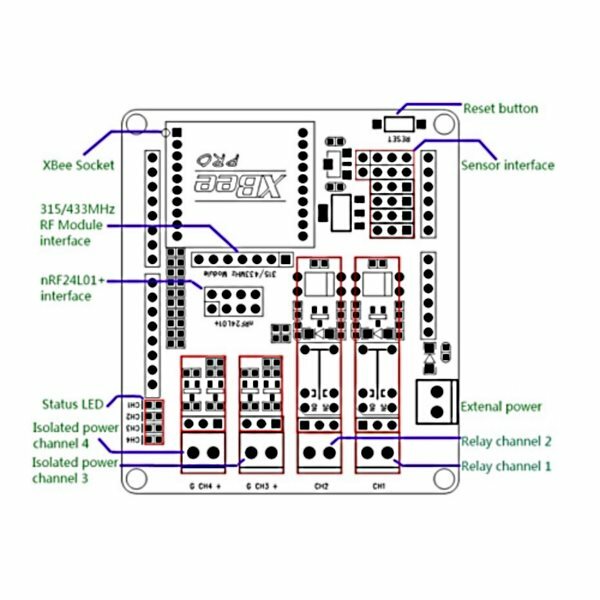 Wireless applications can use the built-in XBee socket to attach a variety of compatible wireless modules. are available to support ZigBee, WiFi, Bluetooth and other wireless communications technologies. An nRF24L01+ wireless module interface is also provided. This Interface Shield also provides a handy set of four 3 pin SVG Signal Voltage Ground connectors for analog inputs and two 4 pin connectors for I2C and Serial connections.